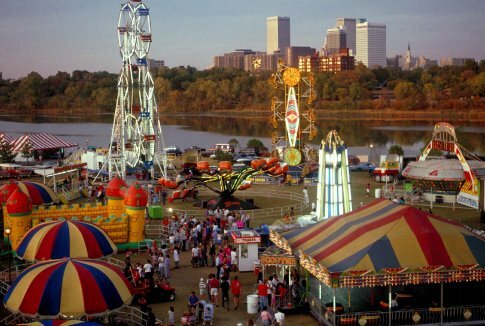 The Tulsa skyline rises in the background of the Tulsa Oktoberfest celebration. German-Americans living in Oklahoma date back to at least the 1800s, so it’s only natural that the Sooner State has top-notch celebrations for this rich culture. Enjoy a lager of beer and a crispy schnitzel at Oklahoma’s best German restaurants, and mark your calendars for fun Oktoberfest celebrations throughout the state, because you can’t spell Oktoberfest without OK. Started by one man in 1979, the Tulsa Oktoberfest has grown from a 40x40 foot tent into one of the country’s top Oktoberfest celebrations. Though the oompah bands have been a staple since the beginning, it wasn’t until 1981 that the famous chicken dance debuted in Tulsa. Though the dance’s name, der ententan, translates to “duck dance,” there was not a duck costume to be found anywhere in Tulsa, so visitors have been entertained by the chicken ever since. Tulsa Oktoberfest has been voted the “Best Festival” by Urban Tulsa Weekly and named one of the “10 Great Places to Celebrate Oktoberfest” by USA Today. This three-day event features authentic German bands, delicious food, ice cold beer and fun entertainment like wiener dog races, beer keg races, beer pong competitions and more. Dance along to live music or savor the flavors of Tulsa Oktoberfest’s famous food like juicy bratwurst, tangy potato salad and smoked turkey legs. Finish it off with a German delicacy like fresh apple strudel or Bavarian cheesecake. A children’s tent will keep your little ones occupied for hours watching artists and listening to storytellers and musicians. Visit the on-site vendor booths for unique wares you won’t find anywhere else like Pilsner glasses, family crest merchandise, and stained glass and knitted items. Oktoberfest at the Marland Mansion in Ponca City features a variety of entertainment for all ages, including children’s entertainment, crafts, a sports tent and car show. Browse the beer garden or find a good seat to settle in and enjoy the live entertainment. Of course, it wouldn’t be Oktoberfest without German food, and there’s plenty of it at the Marland Mansion. Celebrate German culture amid beautiful fall foliage and decorations at Vinita's annual Oktoberfest. This family-friendly event features pony rides, children’s games and booths filled with arts and crafts. In addition to German bratwurst topped with sauerkraut, festival-goers will also enjoy a variety of fair food like funnel cakes, cotton candy and savory turkey legs. Ingrid’s Kitchen has been serving up Old World cuisine in Oklahoma City for over 30 years. Founded by Ingrid Quitz, a refugee from Berlin, Ingrid's Kitchen is equal parts restaurant, delicatessen and bakery, so you’re sure to find something to love. In addition to hearty German favorites, a variety of sandwiches, specials and Sunday brunch is also available. Around Oklahoma City, folks looking for “wunderbar” German cuisine also head to Royal Bavaria. Built to look like a typical Bavarian farmhouse, this brewpub comes complete with wood shutters, dark wood railings and a Bavarian flag outside, while the inside features cozy wood tables and booths, low lighting and an abundance of quirky décor like antler mounts, beer steins and vintage photography. Servers dressed in German costumes whisk out baskets of jumbo pretzels served with three types of dipping sauce and house specialties like wiener schnitzel served with house-made beer. Margaret’s German Restaurant & Deli in Tulsa has been serving up German and European favorites for over 20 years. The owner and namesake Margaret moved to Tulsa with her husband, one suitcase and $200 in 1982, and just seven years later they opened this Tulsa staple. Located in the Farm Shopping Center, Margaret’s German Restaurant offers both lunch and dinner options like jager schnitzel served with mushroom sauce and spaetzle, which is an egg noodle dish pan-fried in butter. A combination restaurant, deli and meat market, Siegi’s Sausage Factory has been offering handcrafted sausage since 1985. Siegi’s uses only top quality meat and natural seasonings in recipes that date to the late 1800s in Austria. Order the Siegi’s sausage plate to feast on your choice of two house-made sausages served with hot German potato salad and sauerkraut. The motto at Mutti’s German Restaurant in Lawton is “just great food,” and that’s exactly what you’ll find. From schnitzel prepared eight ways to homemade noodles and full-bodied German beer, Mutti’s has just what you need to fill that German food craving. The comfortable dining room is traditional Bavarian style with long, communal tables and festive banners hanging from the ceiling. Located in northwest Oklahoma, Café Bahnhof is a welcome oasis serving up a slice of Bavaria. With no domestic beer on tap, you’re sure to get full-bodied, authentic German beer at this Waynoka restaurant. Enjoy your brew indoors or head out to the beer garden. The extensive menu has all your favorites from warm pretzels to jaeger schnitzel.